The Foodie Monster! 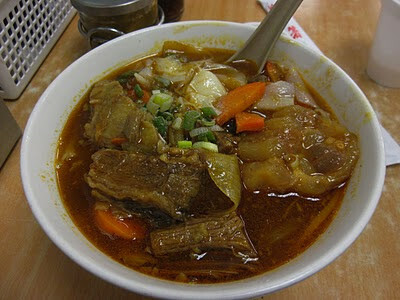 : Beef Curry Noodle Soup from Grand Bo Ky in Chinatown! Beef Curry Noodle Soup from Grand Bo Ky in Chinatown! I've been going to Bo Ky on Bayard St. in Chinatown for years now and new location was opened on Grand St called appropriately enough...Grand Bo Ky! Had a chance to go there recently and saw they have the same menu, including my favorite: Beef Tendon and Belly Curry Noodle Soup, served with a choice of flat rice noodles or egg noodles. This time I got it with the flat white noodles. This is one of my favorite cheap eats restaurant in all of NYC and one of the heartiest noodle soups you will get! It came with a fist-sized beef tendon chunk! Two locations: 82 Bayard St, NYC or 216 Grand St in NYC. Both locations are in Chinatown and only blocks away from each other!